I´ve got a question regarding a certain backup programme. I want to make a complete system-backup (not just personal data/folders). Plus, it really should be freeware. 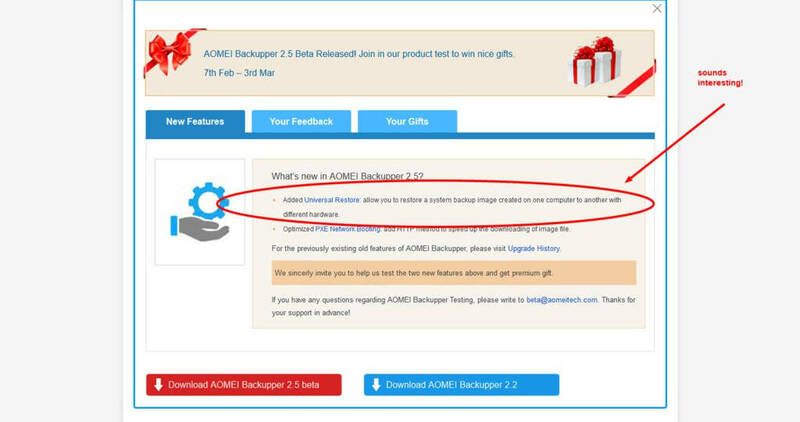 Searching for a commendable backup-programme I found AOMEI Backupper 2.5 beta (see screenshot in attachment). The (most) important thing for me is that the respective programme should be able to restore a system backup image created on one computer to another with different hardware. Looking at the above mentioned page I´m not quite sure if the programme is/remains free. Furthermore I don´t konow what to think of it. Does anyone know the backupper version 2.5? I´d really like to hear some opinions before downloading and installing it. The information on the Aomei Backupper page is certainly not clear. Generally speaking, beta testing a product is free. It's like a barter system - you download and use the software for free in return for providing the developer/vendor with feedback on any bugs/issues you encounter. 1) The software is only free to use during the beta testing period. 2) Because it is a beta product, the likelihood of it including bugs/issues is high. There is no freeware product I am aware of that will restore to dissimilar hardware, this is usually a feature restricted to Premium or Professional editions. thank you so much for replying in such detail. Your information was exactly what I was looking for. As for the fact that there´s no freeware with the ability of restoring a (bootable) system to dissimilar hardware ..... I guessed as much. I didn´t find one either. So all in all it seems better to stick with one of the regular backup programmes. Thanks again and have nice day. You are most welcome Rosika. BTW: Windows 8/8.1 includes brilliant hardware support. I've restored a Windows 8 image to different hardware on two completely different machines, without the proper software (feature), and had no problems. Of course, there is always the issue of re-activation. So, if you're working with Windows 8/8.1, the restore to different hardware feature is likely redundant anyway. thank you very much for your new reply. 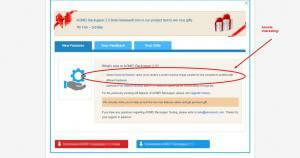 I´ve just read your article by following your link you kindly provided. So, I had this bright idea of restoring an image to the old Windows 8 hard drive I’d previously put aside, connected it to my newer machine, and got the shock of my life when the operating system actually started to load. What I´d really like to know is how you created that image. What kind of backup or imaging programme did you use? That seems interesting all the more, as things worked out quite well for you, which is really fine. Hey Rosika you can look here to read up on some back up and recovery software. That page seems to list a veriety of programmes that are qualified for my purposes. Plus it offers direct links to the respective producers´ pages, whis is really fine. The image was created using Acronis True Image, which is a commercial software. However, that's really beside the point, it was actually Windows 8 which did all the work, it wouldn't have mattered which program was used to create the image. thank you so much for your latest feedback. I understand that WIN8 did a great job restoring the image. Yet I was just curious about yor backup programme of choice. I also read your article on aomei backupper free. I think you´re doing a wonderful job reviewing different bits of software. In the meantime I downloaded and installed aomei. What impressed me most is its convenience and simplicity of use. And thanks to your report I feel it´s reliable as well. So thanks again for all the time you spent helping me with my matter.